Fourteen year old Carter Kane travels with his Father, Julius Kane, around the world as his dad is an archaeologist. His sister, Sadie Kane, lives in London with her grandparents. Carter’s and Sadie’s mother had died in an accident. After Julius blows up the Rosetta Stone in the British museum, Carter and Sadie are pulled into questioning and meet their Uncle, Amos, who takes them back to his mansion. Amos then explains that Sadie and Carter are magicians and so was their dad. Their dad was trying to bring their mom back from the dead, but accidentally released the god of the dead, Set, who wants destroy the whole world. When Amos leaves the mansion for a little bit, two seopards, magical monsters sent by Set to capture the children, entered the mansion. Sadie releases her cat, which turns into Bast, the goddess of cats. 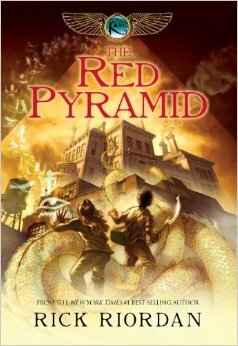 Bast leads the children to a pyramid where they run into the goddess of scorpions. Zia, a member of the House of Life, protects the children from the scorpion goddess and transports them to the Hall of Ages. They break into the chief lector’s house to get a book to defeat Set. From here, their adventures go from Washington DC, to Memphis, and to Phonix,where they fight Set. During the battle with Set, Sadie sees her opportunity to bring her father back from Set, but if she does, the whole world will be destroyed. The novel gives good description of characters and places so it is easy to imagine settings and characters. The novel has constant action so there is never a dull moment. It is easy to identify the plot as it is made very clear. Each event that Rick Riordan put in the book had a purpose. He did not ramble about things that would not be important in the end of the book. However, the book has many different events that occur so by the end of the book, it will be very difficult to remember them in sequence. The book word choice could be better as the vocabulary is a little weak and should be more difficult. I would recommend this book to children who are twelve years old. I would give the book nine out of ten stars as I would have liked it better if the vocabulary was stronger. 1a. He is Julius’s brother. 2.Why did Julius try to summon a god with the Rosetta Stone? 2a. Julius was trying to summon his wife from the dead. 3. Where was the mansion that Amos took Carter and Sadie to located? 3a. It was located in Manhattan, New York. 4. What god did Sadie’s cat turn into? 4a. Sadie’s cat turned into the Bast, the goddess of cats. 5. Where did Zia take Carter and Sadie after they escaped Serqet? 6. What did Set use to trap Osiris? 6a. Set trapped Osiris in a golden coffin. 7. How did everyone in Zia’s home village die? 7a. Zia’s father accidentally released a monster from a statue he discovered. 8. What does the glowing eyes of the “Set Animal” mean? loose it. It also means that it will now be able to track you anywhere in the world. 9. Which state and which college did Carter, Sadie, and Bast find Thoth in? 9a. They found Thoth in Memphis. He was in the University of Memphis. 10. Why did Carter and Sadie’s parents release Bast from the abyss that Ra had put Bast into to fight Apophis forever? 10a. Carter and Sadie’s mom had foreseen bad things. Bast had started to loose the fight against Apophis, so Carter and Sadie’s mom released Bast from the abyss to give her some time to rest before going back to fight Apophis again. 11. Which city did Anubis take Sadie to when she had reached the Hall of Judgement? 11a. Anubis took Sadie to New Orleans. 12. When did Amos come back to help the kids? 12a. Amos came back to help them when the children were fighting Sobek. 13. Why did Zia want to meet Carter alone? 13a. Zia wanted to meet Carter alone because she wanted to tell him Set’s secret name because it was the key to defeating Set. 14. Zia was a godling. Which god was she hosting? 14a. Zia was hosting Nephthys. 15. What deal did Carter and Sadie make with Set? 15a. They agreed to release Set into the duat until chaos is needed. When chaos is needed, Set will have to obey Carter and Sadie.